Only 12,632 people died in a spectacular hail of gunfire like Nathan Drake in Uncharted 3 in a year. Only 1,981 were dispatched like a guard in Assassin's Creed. Just 7,032 people shuffled off their mortal coil like Slippy Toad. Chances are when you eat it, it will be at the hand of a stroke, heart attack or something mundane like the flu, according to figures from the National Vital Statistics System and National Center for Health. 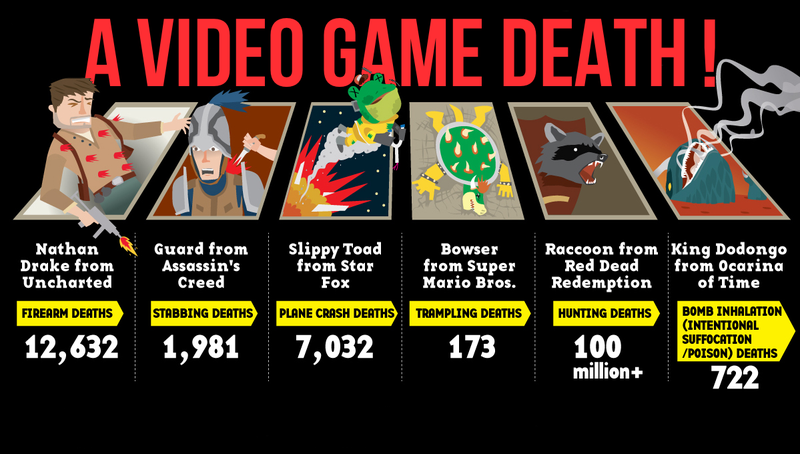 Created in conjunction with Daily Infographic and Infographic World, this chart shows you the odds of how life will likely end for you... even if you're a video game character. And don't worry, I didn't spoil the plot of Uncharted 3. We're talking about the many player-controlled, non-permanent deaths of Drake. We've updated the story to reflect that these death numbers are totals, not odds. Sorry about the confusion.